While arranging my library, I dusted off a copy of Lanterns on the Levee by William Alexander Percy. And while inspecting the book I found a bookstore sticker placed discreetly on the back inside board of the book. The bookstore was Hansell's. 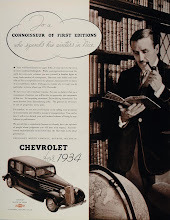 Published March 10th of 1941 this book was owned by one Francis B. Wilkinson. I have no expectation of finding out anything about Miss./Mrs. Wilkinson but I am thrilled to find this posting of Hansell's. Do you know if the building remains? 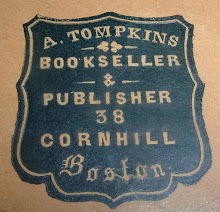 Can't shed any light on your book's previous owner. Not too many Francis B. Wilkinsons out there, but a lot more Francis' without the B. And I'd guess that Francis was a man--the female version of that name is usually spelled Frances (with an "e"). I don't think the building is still there, based on this photo from 1956 of a building at 715 Canal Street. The building in the photo appears to be four stories, whereas the illustrated 1900 version appears to be five stories. 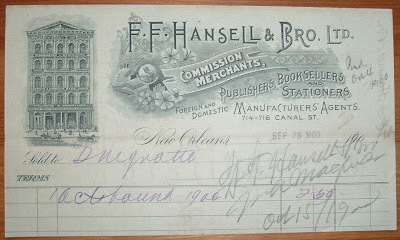 Hansell's was at 714-716 Canal St. Today, there is a business called Children's Place at 714 Canal Street. Don't know what else might be there. I'd love to see the label you found from the bookstore. 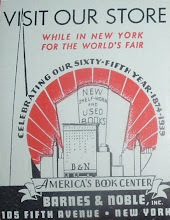 Others would, too, at The American Book Trade Index at Flickr. Thanks for getting in touch--nice find! Was looking at my label collection and was making sure I had uploaded what I wanted on Flickr, and lo and behold, FF Hansell! Thanks for posting... I found an FF Hansell in a book a few years ago--different color and design from yours--but didn't want to fork over $25 just for the label (the book was of no particular interest). Sans camera at the time. I have an original New Orleans Public School Spelling List (original copyright 1916 F.F.Hansell And BRO., Ltd.) revised 1930 .It was for my mother who was born in 1925 and died in Feb. 2010 @ the age if 84 > this is a real conversation piece in our family due to the nature of its origin in time !!!! Thanks for the info. That gives some idea of how much longer they stayed in business. We know it was at least until 1930. Sounds like a treasured family piece you have there. Thanks for writing! I am trying to sell an antique chair for a friend that has etched plates on it with "Hansell's New Orleans Office Outfitters School Supplies"
& "U 1536". It is wooden with a rattan back on it. Is anyone interested in making an offer? I think I can add some helpful info. 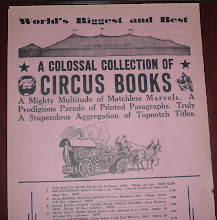 I have a Guidebook for New Orleans which was published in 1893 by F.F. 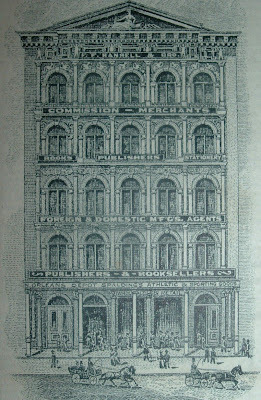 Hansell and Bros. with an address of 126 Canal Street. I know that differs from the information here about them being at 715 Canal Street. Maybe they moved after 1893. Good information--thanks for adding to this!